Process and plant engineers in heavy industrial facilities responsible for optimising combustion or pre-heated air to large boilers, stack emissions monitoring and reporting, or flue gas/scrubber balancing, will find the next-gen MT100 Series Multipoint Thermal Mass Flow Meters from Fluid Components International (FCI) and available from AMS Instrumentation & Calibration (AMS) set a new standard in performance accuracy, reliability, ease of use and value. 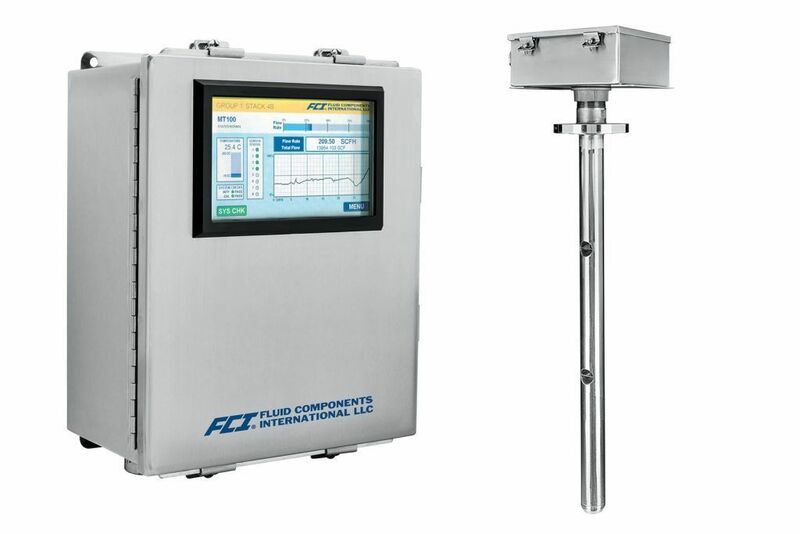 FCI’s breakthrough MT100 Series Air/Gas Flow Meters combine state-of-art electronics technology with application-proven precision flow sensors in a rugged package designed for the most demanding plant operating environments. They provide temperature-compensated direct mass flow measurement of air and gases for precise, repeatable measurement with low maintenance requirements in large diameter pipes, stacks and rectangular duct installations. In electric power generation, petrochemical refineries and other heavy industries, large diameter pipes and ducts present unique challenges to achieve successful flow meter installation and performance. Hot, moist and/or dirty gases along with lack of pipe straight-run, distorted flow profiles, low flow rates and wide turndowns rates are common performance challenges for many flow metering technologies. In hot, dirty and/or moist or corrosive stack gases, the MT100 Flow Meters also excels because there are no moving parts, orifices or glass windows to foul or clog. The instrument can measure air/gas processes operating up to 454 °C. The MT100 Series Flow Meters can measure flow rates over a wide range from 0,07 to 305 NMPS with 100:1 turndown and with excellent accuracy of ± 0.75% of reading, ± 0.5% of full scale. They are also dual-function and can provide temperature measurement capability from -45 to 454 °C, with an accuracy of ± 1,1 °C. Its best-in-class large color touch-screen LCD readout provides comprehensive process information to users with both analogue and digital displays of flow rate, temperature and totalised flow, a user time-base selectable strip-chart of flow rate and sensor status diagnostics. The transmitter’s enclosure is superior, corrosion resistant stainless steel and carries a NEMA 4X/IP64 rating. MT100 Series electronics also include a user programmable data logger feature to which flow rate, temperature and totalised flow as well as fault codes can be recorded on a removable, 8GB microSD card. The instrument also features a calibration drift check, which can be initiated on user demand or programmed to run automatically. Results of the test are provided with simple pass and fail messages presented to the operator on the LCD readout, and, if run automatically, the results are recorded to the on-board data logger. Available with an optional Continuous Emissions Monitoring System (CEMS) package, the MT100 Series Flow Meters meet the requirements for U.S. Environmental Protection Agency’s (EPA) CEMS and Continuous Emissions Rate Monitoring System (CERMS) applications. The MT100 CEMS option includes an automated and on-demand self-checking of calibration drift (CD) and sensor interference. The results of the CEMS tests are presented as a simple pass or fail message on the LCD readout. The CEMS option also includes two relay outputs for connection to external devices, one to signal test in progress and the other to signal a fail-test mode.